Today in Dallas, Texas it was 105 degrees. ONE. HUNDRED. FIVE. That makes my fingers sweat just typing those words. 105 degrees…and that was not EVEN a record–its been hotter on this date! The hottest I recall it being in the 21 years I’ve lived in Texas was over a Labor Day weekend in the late 90’s. That banner day saw the temperature rise to 113 degrees. EXCUSE ME?!? 113…DEGREES?!? I do not live in Palm Springs or Death Valley. Last time I checked, the Equator was quite some distance away, yet here we are, baking in the oven known as Texas. I remember thinking on that 113 degree day, that I had most certainly prayed the wrong prayer. God has a sense of humor. I know He does. Within a few weeks following my heartfelt prayer, I had signed a contract to teach Kindergarten in Keller, Texas. I knew not a soul in all the Dallas/Fort Worth area, but I was moving to Texas! The day I arrived in Texas from Alabama was August 1, 1992, and good Lord in Heaven was it ever HOT!! Now, before I go any further with this heat issue, let me say that truly, the Lord answers prayers and the Lord puts you (me!) right where you need to be! Hot weather aside, I have loved living in Texas! Texas has been very good to me, and the Lord knew that Texas was right where I needed to land. The love of my life was found right here in Dallas, just two short months after I arrived. As a Kindergarten teacher, I was blessed with incredible administrators, colleagues, students and parents throughout my teaching career. I have wonderful friends, all for which I am so grateful and know that this is right where I was meant to be for all this time. Texas is a wonderful place…and I love it dearly! Except for one thing…one BIG thing…the WEATHER. Lord help us all, but how I do hate, loathe and despise the Texas weather. Anyone who has known me more than half an hour knows that I had rather have my teeth chattering, be frozen to the bone and have icicles hanging off my chin than endure the heat and the ensuing need to sweat. Surely I am a misplaced Penguin. A misguided Eskimo. An iceberg in a former life. Recently my Mama and I were speculating how this could have happened–someone who won’t even take a hot shower due to such a disdain for heat–ended up in the hot and humid South. We decided when the Stork was delivering me, it misread the delivery information for Alabama instead of Alaska. Well, at least that explains things…. Living in Texas, I learned very quickly that Texans think the only way life should be is the way it is in Texas, including the weather. The summers in Texas are long and brutal….LONG…and brutal. Summer begins to arrive in early April, fully settling in by May and lasting well into November. I remember one year when the Autumn leaves were still falling from the trees on NEW YEAR’S DAY….and the trees were sprouting anew by the end of February with the joyous news that Summer was on its way…AGAIN!! THIS IS NOT NORMAL!!!! Texans for years have been saying, the reason we live here are for those 75 degree days we get in January and February. Uh, no thank you. If I have to roast in the summer like a pig on a spit in the fire pits of hell, I had darn better have some COLD WEATHER in the Winter! It’s best not to get your hopes up on that one…having cold weather in the Winter. It might get nippy for a few days here and there, a couple weeks if I’m lucky. But then, before you know it, it’s a hundred degrees of Summer all over again. People seem to think its freakish for someone to prefer cold to hot weather. To those folks, I guess I am king of the freaks…because I LOVE cold weather, and I will be dancing a happy little jig with every advent of the season’s changing! Maybe one day we will live up North…maybe…at least I can hope! For now, I live in Texas where Summer seems to last forever, and where the Lord answers prayers…ALL KINDS of prayers! Just not always as WE intended, but hey…at least He didn’t send me to Florida, where He KNOWS I couldn’t stand the heat! One more day, and it would have been POSTAL!! POSTAL, I TELL YOU!! I would not have been responsible for my actions! The reason for my unbridled last leap over the edge of Lunch Duty sanity? I shall tell you. It should never have happened. Yogurt. In a bendable, breakable, spewable, squirtable, gushable plastic enclosure. Yogurt should be in a cup, plastic and disposable. Sturdy in the event of an ‘oops’ or ‘splat.’ Instead, somewhere in a laboratory deep in that mystical, mythical land of “WHAT IN THE HELL WERE THEY THINKING?! ?” there was a day when some nimrod inventor, in his own personal “Ah Ha! moment came up with the OH so clever notion of putting a squishy food in a little plastic sleeve. Toddlers and other unsuspecting youngsters in their formative years of acquiring table manners, could now on a whim push, slosh and spew Go-Gurt in projectile fashion onto their faces, faces of friends and every other surrounding surface for a 4 square mile radius. Should the young tots chubby little stubbs, one day to evolve into dextrous digits known as fingers not be able to “Tear here –>”, our young problem-solvers move to option number two: gnawing the little plastic sleeve until the Gurt within goes…EVERYWHERE!! Usually at some point midst gnaw, the little plastic sleeve RIPS open top to bottom, with ‘Very Berry’ Go-Gurt gushing onto walls, dashboards, freshly pressed dress shirts, Grandmother’s custom draperies, the Kindergarten teacher’s khakis….well, you get the picture. 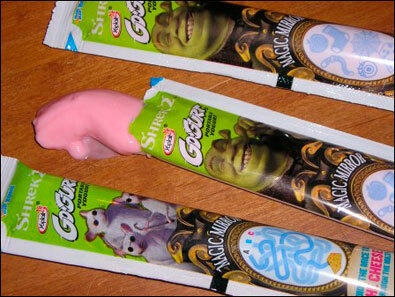 Go-Gurt. Yogurt on the GO! Woo-Hoo! Destined to be found the most ill-conceived food packaging choice in the history of lunch boxes, viciously targeting the table manners of our nation’s youth and their well intentioned OCD care-givers. These oozing squeezers of yogurt on the go will surely be the tipping point of more than one well-intentioned teacher of our young into early retirement, but this is just one opinion, from one Kindergarten teacher. I’m sure there are many Kindergarten teachers and other caring adults out there who just LOVE Go-Gurt! Of course, they are either dead, retired, or today is NOT their day on Kindergarten Lunch Duty! “Uh, Mr. Creel? We’ve had a yogurt explosion over here…and it’s not pretty.” …..Preston, 6 years old. Well, I am just giddy with excitement! In just a couple of weeks, the 2012 Wedding Season at Oak Lawn United Methodist Church in Dallas, Texas will be off and running! Might I also add, IT’S ABOUT TIME, FOLKS!! Finally, the long awaited monogrammed shrimp forks have made it onto the gift registry, and the seamstress for the bridesmaids dresses will finally get the last word on color choice: Blush or Bashful. I for one am READY to hear some of those regal organ standards that make my eyes all misty, and furl a lovely bride’s gown and veil ‘just so’ as she heads down the aisle for her big moment! #2. Do not show up to the Wedding Rehearsal drunk. When the flower girl and the Wedding Coordinator are the only ones not reeking of Jack Daniel’s, it does not bode well for a productive evening. #3. Florists who send extra corsages and boutonnieres are given bonus points and preferential treatment. Inevitably too few are delivered, and semi-inebriated groomsmen tend to encounter boutonniere breakage. Shocker! In a pinch, I have crafted stunning corsages out of band-aides, duct tape, and freshly plucked boutonnieres from lapels of ushers for Mothers, step-mothers, jilted biological father’s girlfriends, and unexpected step-grandmothers just back from the defibrillator. I’ve even grabbed a handful of petals from the flower girls basket and transformed it into a lapel flower for a Father of the Bride in the time it took the flower girl to make it down the aisle. All in a days work. It is a standard occurrence for guests to arrive and wander into the church even when the couple is exiting the sanctuary, freshly married! One wedding, just as the music was about to change for the Bride’s entry, that familiar “CREAK! !” of the old foyer doors opening had me beginning to mumble under my breath at the late arrivers. Instead, I turn around and am caught in midst chastise to find a homeless man with a most surprised look on his face, seeing a Bride and her father ready to head down the aisle. In horror, I leap over the Bride’s train and inform the gentleman, pleasant smile on my face, that we are having a wedding and I am just about to send a beautiful bride down the aisle! If he wouldn’t mind, please wait RIGHT HERE and I will be back to assist him in just a few moments. Growing up in Alabama, it didn’t take long to see the unwavering fervor and reverence for Football that 999 out of every 1000 Alabamians holds fast: allegiance to The University of Alabama’s Crimson Tide, or Auburn University’s War Eagles…or Tigers. Whatever. As many of my friends can attest, I was that one token leftover, number 1000. Big woo…. #1: MOVE! The easiest and quickest way to pluck oneself out of the pigskin fray is to pack it up, load it on the U-Haul and find yourself a new zip-code! Word of Caution: Choosing a large college town as your new home could find you right back where you started, with even more uncomplimentary school colors. Plan carefully! Another Word of Caution: If you are addicted to Facebook, and persist in keeping in touch with friends from college days, well my friend, your pigskin is cooked! #3: Learn the Essentials! Friends can explain the rules of the game, why this coach had better be updating his resume, or the benefits of early draft picks. It matters not… those of us who are the one in a thousand will never understand, nor do we necessarily care to understand. That being said, it is the human being’s primal desire to survive. In a confusing world dominated by sports, specifically football, learning the essentials of a team can be a lifesaver! Essential 1: Memorize the History! If there is a famous coach/player/fabled story that is revered as if blessed by God, you better take the time to learn it, and get it right! Even for us ‘one in a thousand’ folk, there are some things you just can’t get around. Find out what they are and commit those details to memory. Your life…or social standing…might depend on it. Essential 2: Learn the fight song! From personal experience, the time spent learning the words AND tune has pulled me out of more than one sticky sporting situation… A friend who cares about your health and well-being should be willing to help you with this daunting task. #4: AVOID THE FATAL QUESTION: If you took the advice of #1 and got the heck out of dodge, yet find yourself chit-chatting with college friends on Facebook one Saturday in Autumn, NEVER, I repeat NEVER say, “Oh, is there a game today?” Once you hit ‘return’ on that question, there is NOTHING, and I repeat NOTHING you can do to help your cause but go straight to #2…Keep your mouth shut from that point on, and lay the lowest you possibly can. This all brings me to ponder how to best address the vexing evening that was last night… Normally, on a football weekend, it doesn’t take too long to see who is the opposing rival of the week. Yesterday was a stumper. As I saw posts fly onto the screen of my iMac, there were so many teams names tossed about I still don’t know who it actually was that my Alma Mater, The University of Alabama was actually up against. Apparently there were other games influencing something about the U of A’s final standing. There was confusing, though similar dialogue being posted from Texas friends with no obvious Alabama ties, some pulling for opposing teams, some for U of A. Alabama fans were swooning over having to cheer for USC. It was Bama and Baylor and Oklahoma and USC and even dear old Vanderbilt keeping the status updates smoking hot! I just decided that my best option was to keep the mouth shut and lay low! Who cares what its all about anyway…I’ll just check the status feed next Saturday on Facebook and all will be clear! OH DEAR HEAVEN ABOVE….next Saturday….the Saturday after Thanksgiving…is the Iron Bowl! Alabama vs. Auburn. Thank you God, for giving me the good sense to go with the U-Haul and a new zip code! AMEN!! The days of “Summer Vacation” are quickly winding down. Back to School sales are in full swing, and I am marveling at the fact the my niece Mary Claire begins her Junior year at Cullman High School, and my nephew Ben will start his first year in Middle School. Time flies–whether we are wanting it to or not! As much as I loathe the heat of this season, there are many things that over the years have endeared this time of year to the heart strings. Summer vegetables: a REAL summer tomato, red through and through, which can’t be found worth eating at any other time of year. Green tomatoes fried up by the platter full are right up there at the top of summer loves in my book! Memories of stringing beans, shelling peas, and hours upon hours of catching fireflies in a mayonnaise jar late into the hot summer evening, provide a bit of redemption for the days upon end of sweating…and sweating…and sweating. Growing up in my family bestowed a love of the mountains if by default, with most every summer vacation finding our family of four trekking north to the Great Smoky Mountains and Gatlinburg, Tennessee. The beach? Who needs it?!? We had the Smokies…Cades Cove, Newfound Gap, breakfast at the Pancake Pantry, and a balcony over the Little Pigeon River, courtesy of Rocky Waters Motor Lodge. Yes, summer did have a perk or two!! A few months ahead of summer’s arrival, Mother and I would send off for the latest brochures from the Gatlinburg Chamber of Commerce. When they began arriving in our mailbox, it was almost as euphoric as the arrival of the Sears and Roebuck Wishbook…almost! Brochures in hand, planning could begin in earnest! And plan, I did! My first checklist item was phoning my Granny asking to borrow the classic Samsonite luggage, the only proper mode of transport for my vacation wardrobe across hill and dale to Rocky Waters Motor Lodge! Over the years, there weren’t too many inns, motels or “Motor Lodges” that we didn’t try out. My personal favorite was always Rocky Waters Motor Lodge. For some reason, a “Motor Lodge” had a nostalgic feel to it, and with a balcony over a mountain stream beckoning us to the sounds of rushing water over rocks of the Little Pigeon River, Rocky Waters was a hands down winner! In the weeks leading up to vacation departure, days would be meticulously crossed off the calendar in eager anticipation of our family’s mountain get-away! Mama would always secure a box to be placed on the Living Room sofa a couple weeks ahead of time. There, we would gather food items needed for mountainous picnic lunches. Tiny cans of Deviled Ham (with the paper wrappers on the outside of the can), Ritz Crackers, Vienna Sausages, Jif Peanut Butter, Beanie Weenies, White Bread, a knife to slice tomatoes, and a bottle of mustard. If there were nothing else in that box, there would be a bottle of mustard. Mama seemed to think that she could not leave town without French’s mustard safe and secure inside the sacred food box! The plaid cooler, paid for with stamps at the Top Value Trading Stamps store would find its place beside the food box about a week before we left. 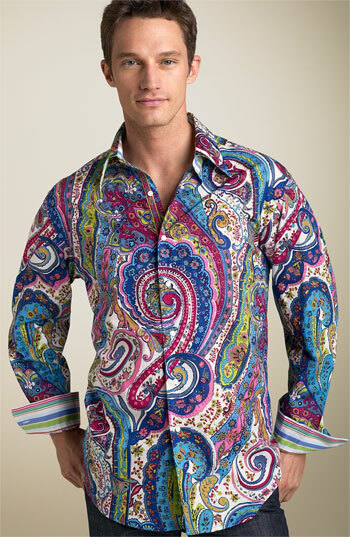 Granny’s Samsonite would be laid out on my bed awaiting all of my meticulously folded, carefully coordinated outfits. Without fail, I would be packed and ready to go at least a week ahead of time. My sister Amy would have me worried to death not taking the time to pack until a day or two before we would leave for the mountains! However, Amy’s vacation belongings would be on the ready by the evening before departure. That is when she and I would have our ‘trial run’ for vacation travel. On Vacation Eve, as soon as the car pulled into the carport, post car wash and oil change, Amy and I would begin our organizing of the car’s interior. Pillows, a quilt, lucky stuffed animals that made the vacation ‘cut’, books, my brochures and maps to mark our journey, and various other personal items that just couldn’t be left behind for an entire week were loaded for the much anticipated journey! We would place, shift, situate and shuffle until our little nest in the backseat of the Buick Electra 225 was deemed complete and perfect. Being the siblings we were, different as daylight and dark from the get-go, it was also a necessity to mark off MY space and HER space–that invisible line of the no cross zone, which under NO circumstances was to be compromised, by even a pinkie toe. Then, Amy and I would “practice” being on vacation, sitting in the back seat of the Buick to assure every pillow was fluffed and magic marker was in its place as our vacation dreams began to unfold exactly as planned. One of my favorite parts of the departure was the time of day! We would get up early…VERY early, usually around 4:30 or 5:00 a.m. to begin our mountain get-away wasting not one minute. 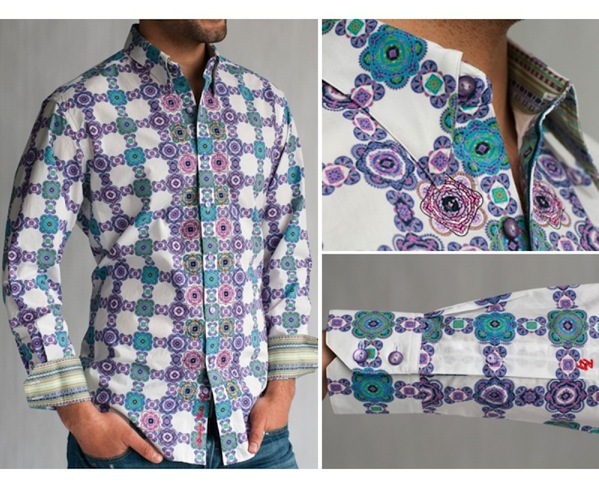 I would be gnawing at the bit to leave–starched, pressed and wide-eyed, vacation ready since 3:00 a.m. Amy, on the other hand would barely be out of bed and dressed by 5:00. Mother would make the ritual tour of the house, at least four times, making sure that the stove was turned off, the thermostat was set to 85, doors locked, windows latched, and one or two lamps left on to make sure the house would appear ‘lived in’ while we were away, deterring criminals and neighborhood hoodlums. Also, there was most likely a double check that the French’s mustard hadn’t accidentally fallen out of the vacation food box while being loaded. When the siblings were quite small and thoughts of 5 hours in the car with ‘fighting and scratching’ mere inches away from my Mother peace of mind, she had planned ahead! Now, lo and all these years later, Mama’s “Surprise Box” which would appear immediately after the utterance of the first “Are we there yet?! ?” Then like the magic that they were, float over the front seat to the back, our wide eyes and eager fingers reaching for our box of surprises, spending the next several hours applying stickers, etching and sketching, cutting and pasting to our hearts content! Even now I marvel at how Mama could find the absolute perfect items for our Surprise boxes! Yes, Mama Frances knew how to achieve world harmony, along with a double dose of peace and quiet right there in the Buick Electra 225! Almost there!! After leaving the interstate in Knoxville, we would marvel each year how much things had grown in Sevierville, Tennessee and especially in the town of Pigeon Forge, which in time seemed to take on more of a carnival atmosphere, devoid of the expected ‘mountain charm.’ Once making it through the traffic of Pigeon Forge, we could smell the mountain air and roll down the Buick’s windows to hear the first sounds of the refreshing mountain streams. The days to follow would be allotted a major activity or destination. 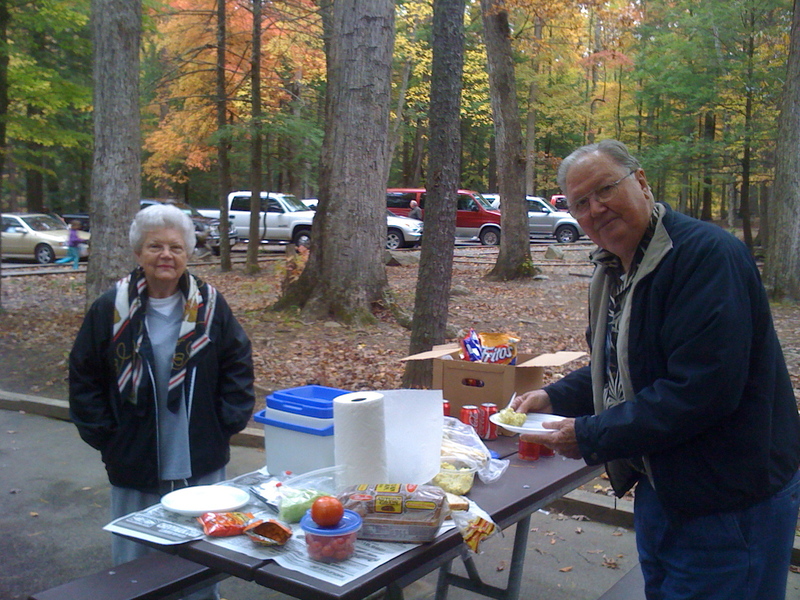 Driving over the mountain to Cherokee, North Carolina one day, the next would be the long drive out to Cades Cove hoping to see a bear or deer before time to select a perfect table next to the stream for our picnic lunch. 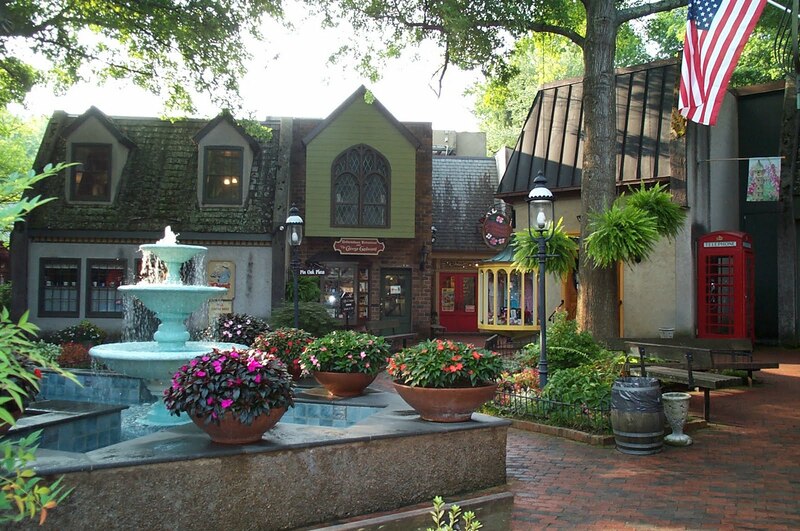 One day would be set aside to stroll about Gatlinburg and wander in and out of the town shops. Mama and Daddy would always have watchful eyes should Amy and I start veering toward The Rebel Corner, a souvenir store of note that had a questionable area that our young eyes were not ready to see–so says the parents. Tiny outhouses with crass sayings etched on the side, t-shirts with slogans even more crass than the outhouse etchings, and my personal favorite, a small plastic lady that when her tummy was pressed her top would fly up revealing the plastic breasts hiding beneath. Oh my, the scandal!!! One day, we would drive about half way up the mountain to the Chimney Tops picnic ground. We could find a table there close to the stream so the parents could scout for bears and other lurking mountain dangers while the siblings frolicked in the stream. There, I could resume my annual vacation ritual of collecting stones from the rushing waters of the streams. Another item of note: It was at the Chimney Tops picnic area where a nutritious culinary concoction, worthy of worldwide acclaim was born: The Vacation Sandwich! The Chimney Top lunch day arrived one year to find the contents of the food box somewhat slim. A jar of peanut butter and some bananas, long past their “Use by” date was just about it. My Daddy mashed up the near brown bananas along with the peanut butter, smeared the mix on some white bread, and mmmm, mmmm!! The Vacation Sandwich had arrived on the Smoky Mountain picnic menu, never to be removed! Vacation bliss! There amongst the mountains and streams, motels and motor lodges, pancake restaurants and salt water taffy kitchens, the Creel family memories of what a vacation should be were made. Cherished then and recreated today, but always just a day or two short of enough. Fun times! Happy memories! Well, most were happy… There was that year when a phone call one vacation afternoon gave an abrupt end to that year’s merry-making in the mountains. Granny, the giver of guilt, called to tell the latest local news: our cousin Allene had gotten married. Yay!! Good for her! But wait….we have to GO HOME EARLY?!? Just because Allene GOT MARRIED?!? WHY?!? PLEEEEEEEEASE tell me this is a joke?? Nope…no joke. Well, Granny considered it her duty to make sure that anyone having a good time felt guilty for doing so. This process began weeks before we left on vacation, and apparently this particular year Granny didn’t feel she gave it her all before we left. The “Allene got married” phone call was construed as subliminal hieroglyphics and interpreted as “You are there having fun, and I am left here. At home. Working tirelessly. In your place. But don’t mind me, enjoy your trip.” Granny had her ways for guilt deliverance, this time with the accomplice of Ma Bell…and our cousin Allene. A random string of thoughts from my brain: Begins with Coconut extract and ends with a spiral staircase. Never dreamed I would be pondering ANY of this as today began… Dan’s making Coconut-Lemon Bars to take to work on Wednesday, did we have Coconut Extract he asked? Once upon a time we did, so I rifled through the pantry, but alas no coconut extract. Dan replied, “Well, I’m sure it’ll be fine without it.” I responded with the cliched response, “Que sera, sera! Whatever will be will be!” Which immediately brought to mind the picture of Doris Day breezing down a spiral staircase for the opening of her TV show, her happy, melodious voice singing “Que, sera, sera!” Final part of the random string: I remember thinking every week during my own private Sing-Along with Doris’, “Que, sera, sera!”, how desperately I wanted to one day have my very own spiral staircase. OMG! More random: I wonder if singing “Que, sera, sera” all those years with Doris is why I wanted to take French in high school?? Epilogue: The virtual ink on this Facebook post was still sopping wet, when a bossy college friend thought it her duty to call a possible error to my attention–wistful stroll down my personal lane of nostalgia brought to a screeching halt–“Que sera, sera” was NOT a song of French origin. I should have signed up for Spanish class instead… Hhhmmpff… I’ll just bet Miss Know-it-All has pent up frustration from living in a single level domicile with little need or desire for a spiral staircase…Bénissez son coeur! Epilogue translation: Bénissez son coeur– Loosely translated from the FRENCH…Bless her heart! My Granny Sula was a trip, to be sure! It was always so funny to hear her chatting away on the phone with any of her friends, the closest of which were Reba and Lola Mae. She loved getting together with them for regular lunches out and what not. However, Granny was a busy lady, and there were times when even the best of friends had to take a back burner, what with preparing food for neighbors and church brethren who had lost a loved one (“cooking for the dead folks” as Granny would say) or putting up a bushel or two of peas or beans (“Keep shellin’…you’ll be glad you did when the snow is on the ground this winter! And besides, folks will be dying in January and I’ll have to be ready with a dish!”). Like anyone, there are some days when even time spent with the best of friends just isn’t the activity of choice…. One particular incident of this nature has become one of my all time favorite Granny stories. Barry: “Hey Gran-maw! What’ve you been up to today? Classic Granny! If she wasn’t “cooking food for the dead folks” she was “dishing it up” at the home after the funeral! Living all her life in the small Alabama town of Hanceville, my Granny–Sula Ballard–took great pride in knowing everyone in town. It was a rarity for Granny to not know at least something about most any name you could throw at her. Granny could also recite the family lineage of most any citizen of the town, both paternal and maternal, at least two generations back, with side notes of any scandal or ancestor of note surrounding the family name in question. After leaving Hanceville to go away to college, I would make regular phone calls to Granny to keep up to date on all the goings-on about town. If there was a scoop to be had, Granny would know! One particular Thursday morning, I called Granny to get myself up-to-snuff on the Hanceville latest. Perhaps Aunt Addie was found unattended yet again, wandering the dish towel aisle at Wal-Mart. Aunt Maybelle might have had coaxed Uncle Howard out in the cemetery one more time with his trusty tape measure. Under the cloak of darkness, Aunt Maybelle and Uncle Howard made careful measurements of each tombstone to assure that the one marking their future resting spot would be the largest on the cemetery grounds. (Tacky!! So says Granny…) There was no telling what family or neighborhood bit-o-tid Granny would relay to me each week! “…and last summer after your Aunt Connie had that dadblasted new central air-conditioning put in, I called 911 late one night and told them to send one of the boys over and turn that damn thing off! I was about to freeze to death! !” Granny added. So, a belated ‘Thank You’ I extend to the Hanceville Police Department for not giving my sweet Granny a ticket…or tickets…for dialing 911 whenever the whim hit. She was a character, the likes of which I dare say Hanceville will not see again! That best states how I have always felt around my Daddy. No one could love a child more than my Daddy has always loved me. Never one to hold back hugs or reassurance of love and approval, my Daddy is truly one in a million. So why ‘Awkward’? That’s a very good question. In the years after moving away from home, I have met friends whose Fathers continue to place pressure on them to live up to certain expectations or fulfill a legacy of daunting proportions. My Daddy has always encouraged me to prepare for a secure future, “So you won’t have to work as hard as your Mama and I did.” But of course he worries…like all Daddy’s…he wants to be sure his “little boy” is in a good place, both now and later. There are so many reasons to be thankful for a Daddy like mine. Daddy has never pressured me to “be” anyone other than who I am. Ever. He has never pressured me to “like” sports, the great outdoors, or British comedies. What Daddy has done for me is embrace my strengths. I have long thought that my Daddy has never really “understood” me, and that may or may not be the case. Whether or not that is the case has never affected the way my Daddy has treated me…with unconditional love my entire life. When I wanted a doll house kit for Christmas one year, that is just what I got. Another Christmas, nothing would make me happier than the Barbie Camper AND Malibu Ken in his oh-so-fashionable florescent orange square-cut swimsuit. Guess what Santa brought? Just what I asked for! Please don’t think that my childhood and life at home was a pampered, silver spoon upbringing, as nothing could be farther from the truth. Daddy grew up on the farm, and being outdoors digging in the dirt is one of his favorite places to be. Not me. Though I was put behind the handles of the lawnmower a few times, I learned the meaning of the word “bargain” early as I would offer to do most anything this side of Tennessee to avoid pushing that lawnmower one inch! Inside the house, I would constantly rearrange the furniture, organize the closets, fold the laundry with corners matched, and iron whatever needed to be ironed. Bookshelves in the Den and the China cabinet would constantly receive a fresh and updated look as I flexed my muscle as our home’s Interior Decorator in residence! Even now, Daddy will tell me before I sit down my suitcase, “We need you to take a look at the mantle, and the China Cabinet will need a little sprucing up before you head back to Texas!” Daddy appreciates my strengths, and thank goodness for that!! So why DO I feel awkward around my Daddy? Always a “Mama’s boy,” I guess I never felt I could relate to my Daddy in the areas of things he enjoyed most: sports, gardening, being outdoors. Of course there are definitely characteristics that I share with Daddy…we are both social beings, enjoying having company, preparing for a party or large event. We love the mountains, and had rather spend a vacation among the peaks than on the beach any old day! Traveling and seeing places undiscovered are common favorites. Packing a car for a trip or a moving van full of furniture, Daddy and I can put collective skills up against the best! Dan still marvels at how much I can get into a small space, and I can give no other the credit than my dear old Daddy!! Yes, I must confess…I enjoy telling a good story just as much as my Daddy does…though please, friends…if I ever begin repeating stories over, and over, and over, just humor me. My Daddy is known to recount tales a time or two. Or twelve. Or twenty. I’m learning to bite my tongue and smile as he tells the Mickey and Minnie Mouse stuffed animal story for the nine-thousand forty-second time…this year. As I have gotten older, there have been times where something I did or said stopped me in my tracks causing me to gasp aloud, “That was just like my Daddy!” Even though it may be a shocking experience at times when I moan with creaking bones as I get up off the floor, or even the sound I make when clearing my throat, being ‘just like my Daddy’ is not a bad thing at all! Oh, but that more things I do should be like my Daddy….except of course for voting Republican, or putting butter on a biscuit. Drinking coffee? Sorry, Daddy! I’ve got to keep a bit of individuality! Fear not, though Daddy dear! Let there be no doubt I am my Daddy’s child, a Creel through and through! The ‘Tiz’ we get in when times running short before a due date, the unrelenting internal motor that will run at times until it literally runs out, are but a few things that forever connect our fraternal heritage. Not once has my Daddy given me reason for this awkward feeling that at times gnaws away at me. Living up to what the world says a ‘Son’ should be I know is what causes unwarranted feelings of guilt and awkwardness. A blessing of the greatest sort has come in the form of my wonderful, athletically gifted nephew Benjamin to lessen my awkward feelings. Finally, Daddy has got his chance to sit in the stands and root for his home team! Ben has brought more joy to Daddy than I ever could have imagined, and it warms my heart to see the pride Daddy has been able to shine on Ben in all of his athletic accomplishments. For years I wondered why God didn’t bestow on me just a LITTLE athletic prowess, now I know. God was saving it all up for Ben, for surely it would have been wasted on me!! Though I will never be a Father or a Daddy…a Grandfather or a Paw-paw, I have been blessed with the best there is, my Daddy, Leo Creel. He has blessed me with unconditional love and support for the past 48 years, and for that I can never fully express my thankfulness, gratitude and love for him. I am a lucky boy, truly I am. Hopefully, my Daddy feels the same way. I love you, Daddy from the bottom of my heart! HAPPY FATHER’S DAY! !